hello all and happy wednesday! i am doing my segment for the daily dish on channel 4 (abc) today! it will be airing at 11 am and for those of you who are locals, you can tune in to watch me talk about graphic tees and check out some comfy summer looks! for those of you who may not be able to watch it right away, the segment should be posted online on the daily dish's website after it's aired, so i will try and get it posted after they've got it up! Ah so glad! Thanks girl! Thanks lady! I've definitely been gravitating to them lately! LOVE that shirt!! Can't wait to see you on the Dish! LOVE the Tshirt.. however when I clicked on it didn't have the wording? Did you add that as a special order? Adorbs from head to toe! Hah I love your shirt! i hope i look this good when i'm pregnant! Oh my, you are so sweet! Thank you! 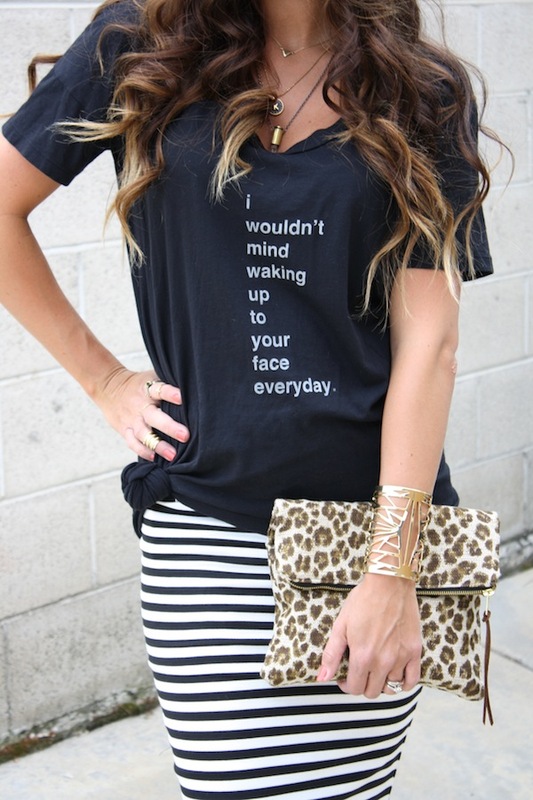 Love the striped skirt! Hopefully you had fun at your abc segment! Excited to see it! Where did you get the cute gray skirt that looks like sweats and the bull skull tee you paired with it? Where do you order your tees like you wore yesterday? So cute!